KNIME Analytics Platform Reviews Recently Reviewed! KNIME is a powerhouse for all types of analysis, including machine learning. 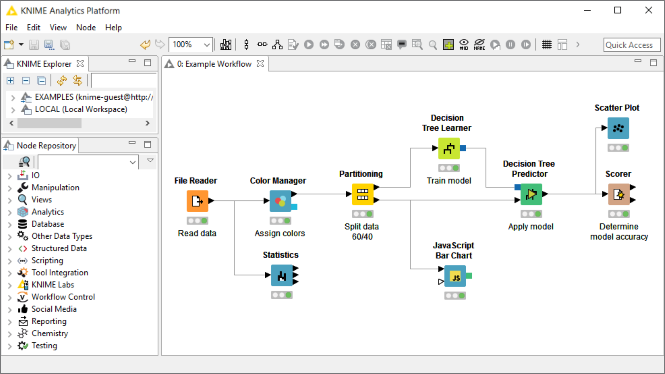 Pros: KNIME desktop is a powerful tool for building analytical workflows. The visual interface is extremely helpful. They also have extensions to integrate other tools like R and Python into the workflows. Best of all you can share your workflows with others - great for reproducible research. There are built in tools for many types of supervised and unsupervised machine learning. The desktop application is free and open source. The support community on the KNIME website is very active and responsive. To extend the features you can purchase KNIME server. Cons: Like any new tool there is a learning curve. However, they have lots of videos, examples and an active support community. There are some features that are not intuitive, such as how to use flow variables. In general I have found that I use R much less now and do most of my analysis in KNIME. KNIME is primary drag and drop and requires little to no coding. Overall: We were able to build a reproducible workflow for analyzing our data and creating actionable insights. Pros: Knime is very useful to analyze large data quantities with advanced algorithms and code without the need to program because you use block modules that do a specific task and you put program graphically the data processing you want to do connecting this blocks to other in a specific order. You don't need to be a data scientist or engineer to use it is useful in HR and Finance sector to automate manual processes. You can directly input an excel file or database. The software is free but you may purchase a server license to have a process run automatically with large amounts of data from many sources. You can also program if needed and add external blocks to the software. Cons: You actually need more help than provided by block description if you want to do complex data analysys tasks, if you want advanced data analysis and classification you do need to have software engineering knowledge, you can only run a workflow if you have it in the knime folder not any other location of your computer. Knime can take time to initialize if you have many modules installed so install only the ones you need if not it may take 5 minutes or more to open in a regular computer. Overall: Knime has turned manual tasks in easy and fast ones just pressing a button to run multiple commands on a excel file for example. Very useful tool to automate and reduce task time. Pros: a) As an ETL tool, It is feasible with the other database and accounting each and every logs. b) It collects, reformat and upload the data sources in a proper structured format. c) The UI is simple to understand even if the person is not familiar with the analytics then also she/he could understand the functions. d) It can be integrated with software like Phython and R softwares. Cons: a) I have tried to integrate knime with the Jupiter notebooks but that was failed. Pros: Doesn't require coding, programming skills to perform data mining. Cons: Visualization capability may not appeal to some. Overall: Performed data mining and predictive analytics on this software. Its easy to master and customer support is good. Pros: KNIME allows you to focus on the data science and not the programming to get there. The point and click solution is easy to use. Cons: There are many options and in-app support/help/guidance would make this tool even more user-friendly so that the data science team can focus on data tasks.